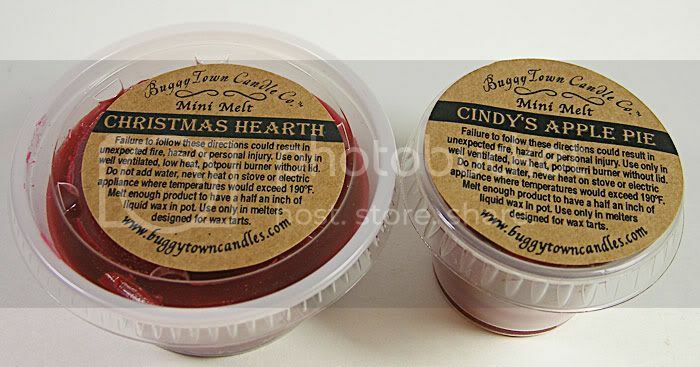 xoxo, Jen: Buggy Town Candle Co.
--This is really every scent that Christmas brings with it. Smokey fireplaces, pine, apple cider, and baked goods. Its really a trip down memory lane! So cozy and yummy. Cindy's Apple Pie was a freebie, which I did not expect for such a cheap order! Aroma of Cindy's homemade apple pie straight from the oven. --This one is very cinnamon and very apple, with a touch of sweet sugar but not candy like. I love the souffle cup packaging, the labels are soo cute and prim, the way the wax looks soft and silky almost, and how heavily scented these appear. I think Buggy Town nailed this scent and has done an excellent job with this tart! I'd love to try these but I'm not having any luck finding the free shipping. Was this a one time special?